Here is where you will find fantastic true Ghost - Mystery stories! As the leader in our field we aim at providing for you some of the best true stories of this kind. 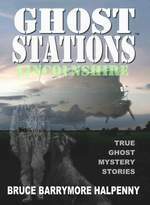 Please note that the Ghost Stations Series of books will be published in the near future as ebooks. This move is to be part of our expansion plan and taking advantage of current technology as well as adapting to the current market and trends. It also is sound business sense in this increasingly competitive market, especially where prices are constantly increasing, paper prices, printing and postage as an example. However, we have not abandoned the traditional printed form as Ghost Stations Classic and Ghost Stations Lincolnshire (the new version) is available from all good book shops, or direct from ANZIO Group. 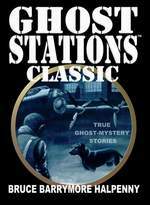 You can buy/order the GHOST STATIONS™ Books from any good book shop, or direct from ANZIO Group. Also, if you live in Lincolnshire or are visiting, then please visit any of the Main Lincolnshire Shops selling GHOST STATIONS™. Information on these shops can be found by clicking HERE! A new GhostStations.com Website will be coming soon!